I am headed off to Paris this weekend, so blogging may be light the next few days. I am going to try to blog from France, and try to get a sense for the issues being discussed there post-referendum. 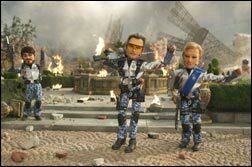 In the mean time, I will leave you with this heartwarming scene from Team America: World Police. If I had a baseball team, I would play that at the 7th inning stretch. The Film Actors Guild (F.A.G. )...tasteless but hilarious. I wasn't sure I was going to like TA until the martial arts experts started fighting in the streets of Paris. I couldn't stop laughing after that. Enjoy Paris. It's not as bad as everyone told me it would be. Buy your museum tickets ahead of time and enter the Louvre from the side. I never waited in line except at the Eiffel Tower. "I'm so Ronery" is great, too.